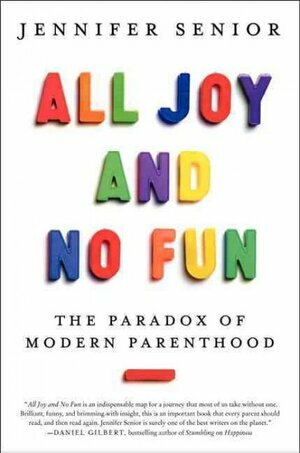 A while ago a few of my Facebook friends linked to an article about the new book All Joy and No Fun: The Paradox of Modern Parenthood. I was intrigued, so I requested the book from the library. Well, it took me a while to finish the book. It's mildly interesting, but there is just too much jammed in there! It gives some history of parenting in America, it profiles some families and it discusses lots of research studies. I suppose it would be more interesting if I was a middle class stay-at-home mom trying to shuffle kids to a million different activities and resting all my hopes and dreams on their successes. But that's just not me. However, the redeeming part of the book for me was that it talked a little bit about the book, Bringing Up Bébé: One American Mother Discovers the Wisdom of French Parenting. I requested that one from the library and LOVED it! It was fascinating to me to discover just how different things are in France. They have different philosophies based on French doctors' research and books that have never been translated into English! I just never thought about this before! (Although recently John and I had been discussing how Catholicism looks very different in other countries, so it shouldn't have come as that much of a surprise). One of the things that struck me was how the French talk about having balance, or equilibrium. They don't want one aspect of their life to overrule the rest. I though this was interesting contrasted with the American ideal of "having it all", or abandoning one thing in pursuit of another. One of the blogs I regularly read recently posted about the book and what it has do say about work-life balance, so you can get a much more eloquent description by clicking over there! Some interesting generalizations about French children versus American ones are that they sleep through the night at a much younger age, they are able to entertain themselves much more readily and they eat a huge diversity of food from a very young age. French parents might be considered strict in certain aspects, but also give their children a great deal of freedom within the boundaries. That book sounds very interesting. I've also heard of it before, but then forgot about it. I think I'm going to check it out!